Bluehost offers two shared hosting plans: Basic and Pro. Both include unlimited domains hosted, storage, file transfer, and e-mail accounts. A domain name (first year only) and automated backups are included with both plans at no additional cost. Both plans provide 24×7 phone, chat, and e-mail support as well as an anytime money-back guarantee. Page-load speed and uptime test results were average to slightly higher. The checkout process is only two steps, but we were displeased with the lack of disclosure and the questionable business practices utilized within the shopping cart. On balance, Bluehost has earned the NCM Online designation of NOT RECOMMENDED. A popular brand amongst webmasters, Bluehost’s Basic shared hosting plan includes unlimited domains hosted, parked domains, subdomains, disk space, bandwidth, MySQL databases and e-mail accounts. A domain name is provided free of charge for the first year only. Also provided free of charge is the Weebly Basic drag-and-drop site builder. The Professional and E-Commerce versions are available at additional cost. Bluehost’s Basic plan also includes access to the MOJO Marketplace script and applications library which is used to install WordPress and other content management systems, in addition to advanced website applications including Lime Survey, phpBB, ShopSite, and more. The Basic plan is backed by 24×7 US-based phone, chat, and e-mail support; as well as an “anytime” money-back guarantee. The plan currently retails at $6.95 per month for a one-year term, and renews at $9.99 per month for a one-year term. The Bluehost Pro shared plan includes all of the Basic plan’s features while adding enhanced server performance, a dedicated IP address, SSL certificate, and higher limits on the total number of files and database tables permitted. Additionally, the Pro plan increases the free domain registration from one year to lifetime and includes domain privacy. The plan initially retails at $19.99 per month for a one-year term, and renews at $24.99 per month for a one-year term. 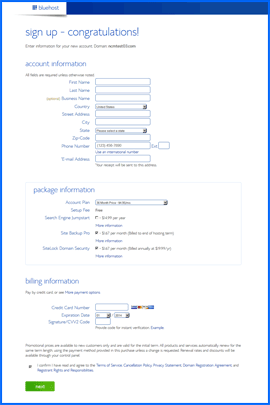 Bluehost shopping cart. Note the preselected items and the “Next” button. Click to enlarge. Note also that Site Backup Pro and SiteLock Domain Security are automatically added to the shopping cart. You must deselect the check boxes in order to remove these additional-cost items from your purchase. Unlike other shopping carts, you do not need to agree to the Terms of Service by checking a box. The checkmark has been added by Bluehost in advance. Further, the “Next” button at the bottom of Step 2, is actually a “Submit” button. After payment information has been entered and a service selected, “Next” generally indicates that the shopper will be taken to a final screen where they will be presented with the total amount due and then decide whether or not to submit their order. As the shopping cart does not indicate a total amount due in Step 2 or during any part of the checkout process, this is a perfectly reasonable assumption. However, clicking the “Next” button actually submits your order. The total amount due is never displayed to the purchaser. This is not the first time NCM Online has encountered these particular business practices. HostMonster’s shopping cart functions the same way. Not surprisingly, the two companies share common ownership and a BBB rating. In response, NCM Online has and will continue to penalize the ease-of-use and satisfaction rankings of web hosting services that employ questionable business practices. For purposes of testing and review, we selected the cheapest available plan — the Basic — using the PayPal payment option to complete the purchase. Note that while the total amount due is not indicated within the Bluehost shopping cart, PayPal does provide the total cost for review prior to submitting your payment. The Bluehost “Welcome” e-mail arrived two minutes after the PayPal receipt. It included the nameserver settings and FTP login. This information allowed us to quickly upload our NCM Test Site (click for sample test site). Bluehost provides a modified version of the cPanel control panel with their shared hosting accounts. cPanel is the industry’s leading control panel with good reason. It permits access to numerous webmaster functions from a single, user-friendly screen. Bluehost includes the MOJO Marketplace within cPanel for installing advanced website functionality apps and content management systems like WordPress. The advertising-laden MOJO Marketplace scripts installer is not quite as fast or easy to use as the Softaculous script installer, but it gets the job done. Bluehost Uptime Test Results Chart. Click to enlarge. All website hosting services reviewed by NCM Online are purchased and subjected to our 10-day test for uptime and speed. 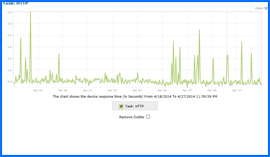 Bluehost speed and uptime testing began on April 18th, 2014 and concluded on April 27th, 2014. The results were not impressive. Uptime issues began on 4/26/14 at 2:36 PM EST and continued for approximately 16 minutes. In all 13 attempts to access our test site failed. All 13 attempts reported the same problem: TCP error 10061 (no connection could be made because the target machine actively refused it). These issues lowered Bluehost’s reliability record to 99.8943%. No other downtime incidents were reported during the 10-day test period. See the first of four test result charts above right. 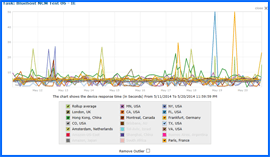 Bluehost Speed Test Results Chart. Click to enlarge. Page-load speed results for the 4/18/14 thru 4/27/14 test period were somewhat more encouraging. Bluehost recorded a slightly-better-than-average 1.5678 seconds to load our simple 1-page test site from 13 locations worldwide, and a distinctly-average 1.2265 seconds from the 7 US test locations. See the second of four test result charts right. While preparing screenshots for our Bluehost review, we took notice of the CloudFlare icon in the Domain Management section of the cPanel control panel. CloudFlare is a global content delivery network and domain name server provider utilized to enhance page-load speeds and provide website security. We had no idea that it was available at no additional charge with our Basic hosting package. We had previous experience with CloudFlare as it is automatically provided with all shared A2 Hosting plans. As A2 had recorded some of the fastest page load speeds we have seen to date, and despite the fact that we had already completed speed and uptime testing for Bluehost, we thought it only fair to give Bluehost a second chance with CloudFlare enabled. 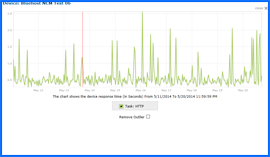 Bluehost Uptime Test Results Chart with CloudFlare enabled. Click to enlarge. Bluehost’s CloudFlare-enabled speed and uptime testing began on May 11th, 2014 and concluded on May 20th, 2014. The results were not what we were expecting. 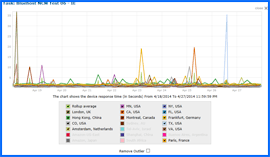 Uptime issues began on 5/13/2014 at 5:10 PM EST and continued for approximately 31 minutes. The DNS 12007 errors (the host name could not be resolved) were limited to our London and Amsterdam test locations, and no additional downtime was reported for the duration of our test. However, the damage had been done. The 30+ minute downtime ruined Bluehost’s otherwise perfect reliability rating with CloudFlare enabled. The 99.7853% uptime percentage was worse than our first uptime test result (99.8943%). See the third of four test result charts above right. Bluehost Speed Test Results Chart with CloudFlare enabled. Click to enlarge. Unfortunately, the CloudFlare-enabled page-load speed test results were even more disappointing. In all, 8 of 1023 attempts to load our test site in a browser failed. Our London, Amsterdam, Montreal, New York, Virginia, and Minnesota test locations all reported failures. Error codes included DNS 12007, TCP 10060 (connection attempt failed because the connected party did not properly respond after a period of time, or established connection failed because connected host has failed to respond), as well as TCP 10061 (no connection could be made because the target machine actively refused it). These failures ruined Bluehost’s CloudFlare-enabled page-load speed test results, producing an abysmal 5.2955 second average. See the fourth of four test result charts above right. We have no idea why enabling CloudFlare produced such awful results for Bluehost, when it had done wonders for A2 Hosting’s test scores. Perhaps the Bluehost CloudFlare security settings caused the network to interpret our testing as a denial-of-service attack. We cannot be certain. In fairness to Bluehost, we tossed the second set of test results and used the 4/18/14 thru 4/27/14 results for ranking purposes. Even if we were to ignore the business practices with which we disagree, Bluehost would rate as an average value at best. Better shared hosting is available at a lower cost. Bluehost has earned 3.5 stars and is not recommended by NCM Online. Cheap website hosting company price comparisons based on 1-year term list price before coupon/promo codes or limited time/introductory offer discounts. These are the renewal rates for the second year of hosting. To ensure that you receive the most affordable Bluehost pricing possible, please visit our Web Hosting Coupon Codes page for current discounts and special offers before making any purchases. The technology utilized by Bluehost differs from other webhosting services as they build and design their own servers for assurance theirs are the best around. The company also has customized the Linux kernel it runs, as well as, uses a countrywide fiber network. They have a datacenter that utilizes many 10 gigabit worldwide fiber connections, diesel generators, and UPS power. When hosting with Bluehost, every customer has access to US-based support around the clock, super-fast servers, SimpleScripts one-click installs, true resource management, and SSH protected shell access. This is all backed with a proven record of webhosting success. These top technology perks, first-rate facilities, and excellent staff will help any customer expand their online business into a success. For upwards of fifteen years, the firm has been doing shared hosting. This means that they truly comprehend the usual webhosting issues. Normally when a user has a rouge application causing sluggishness and website problems for other customers, the application is shut down and the customer is moved to a virtual private server (VPS) or dedicated server. This option is hard to maintain and costly. Bluehost has instead developed a unique solution to address these issues called Hosting Resource Protection (HRP). This is given to all customers for no additional charge. This service offers protection from abusive users who might consume too much memory, disc I/O operations, or CPU. It also keeps the price the same as shared hosting, but gives customers features usually only accessible with a dedicated server or a VPS. HRP is also unified and completely automated. This allows all Bluehost customers to offer their own site visitors a seamless experience superior to the usual shared hosting services. Founded in 1996, Bluehost has since provided premium webhosting for personal and business needs. The company is always dedicated to offering quality services for the most affordable price. They frequently modernize and upgrade their services without adding cost for their customers. They are confident that they can secure any online business by providing a superior level of support with their fully in-house, patient, and friendly hosting team. The team knows how to make any site successful with knowledge of what is needed to get there. This video tutorial demonstrates the installation of WordPress on a Bluehost shared hosting account using the cPanel control panel and the MOJO Marketplace applications installer.